Academic work, like many other professional occupations, has increasingly become digitised. This book brings together leading scholars who examine the impacts, possibilities, politics and drawbacks of working in the contemporary university, using digital technologies. Contributors take a critical perspective in identifying the implications of digitisation for the future of higher education, academic publishing protocols and platforms and academic employment conditions, the ways in which academics engage in their everyday work and as public scholars and relationships with students and other academics. 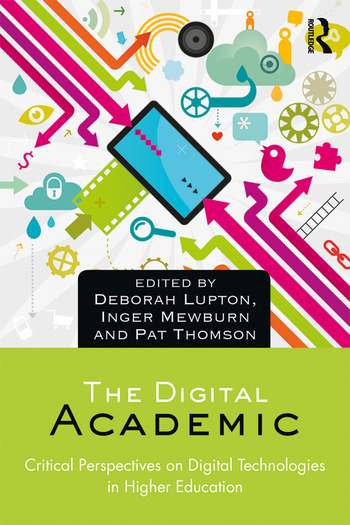 The book includes accounts of using digital media and technologies as part of academic practice across teaching, research administration and scholarship endeavours, as well as theoretical perspectives. The contributors span the spectrum of early to established career academics and are based in education, research administration, sociology, digital humanities, media and communication. Deborah Lupton is Centenary Research Professor in the News and Media Research Centre, Faculty of Arts and Design at the University of Canberra, Australia. She is the author/co-author of 16 books, the latest of which are Digital Sociology (Routledge, 2015), The Quantified Self: A Sociology of Self-Tracking (Polity, 2016) and Digital Health: Critical Perspectives (Routledge, in press), and has also edited three further books. Deborah is the co-leader of the Digital Data and Society Consortium. Her blog is This Sociological Life and she tweets as @DALupton. Inger Mewburn is the Director of Research Training at the Australian National University, Canberra, Australia, where she is responsible for designing, measuring and evaluating centrally run research training initiatives and doing research on research candidature to improve experience. Inger blogs at www.thesiswhisperer.com. Pat Thomson PSM is Professor of Education, School of Education at the University of Nottingham, UK. She is the author/editor of eighteen books, the most recent being Inspiring School Change: Reforming Education Through the Creative Arts (2017, with Chris Hall, Routledge), Place Based methods for Researching schools (2016, with Chris Hall, Bloomsbury), Educational Leadership and Pierre Bourdieu (2017, Routledge) and Detox Your Writing: Strategies for Doctoral Researchers (with Barbara Kamler, Routledge 2016). She blogs about academic writing and research on patthomson.net and tweets as @ThomsonPat.